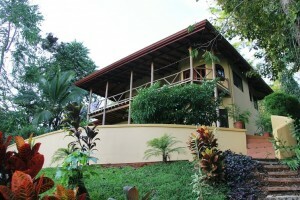 The perfect family home, conveniently located a short easy 7 min drive to the shops, restaurants and beaches around Uvita. Close enough while also being just far enough away to provide your family with a private setting of pristine jungle environment with an abundance of wildlife. This well built 2 story Custom home has approximately 2600 ft2 covered living space, including 3 bedrooms/2.5 bathrooms. With a high vaulted ceiling the design is very spacious, inviting and flowing, maximising the natural breezes. There are numerous exotic tropical hardwoods used throughout the home with high end construction giving a beautiful natural look and feel. The well designed kitchen is large and very easy to work within, and comes with high end frigidaire appliances throughout. The living room, dining room and kitchen all maximise the ocean views creating a capturing scenic atmosphere within. There are plenty of entertainment areas inside and out, upstairs balcony, ground level pool and BBQ area, huge lounge/dining entertainment area, so enough room for guests and family to relax peacefully. The pool and garden areas are teaming with lovely flora and fauna. Also another wonderfully unique feature of this home is that it has its own Talapia fish ponds, where you are able to catch and eat your own dinner right from your own property! The pool is currently stoked with over 300 Talapia, what a wonderful concept of self sustaining to be able to teach your children! A short stroll down the well maintained path brings you to your private river, take a dip in the fresh clean waters to cool off. There is also a ‘Yoga platform’ overlooking the river, a perfect place for some morning meditation with the soothing sounds of the stream. The property is actually bordered by this year around stream with numerous natural pools. This is a one of a kind property with a tonne of value, and with the easy access an ideal location for a rental home, with proven track rental record as well. A very unique opportunity to be able to secure this great investment.